AltME allows you to share files securely with the people in your world and track the status of each file. You may share a file with yourself, one other user, a group of users, or everyone in your world. Shared files are uploaded to the world server where they can be downloaded by users who are allowed to share them. When the local copy of the file is the same as the server copy of the file it is said to be "in-sync". You manage your files through the use of folders as you would on your desktop. Your folders and files exist in the regular file system so they may be accessed outside of AltME as well. This features is currently in final stages of release. It is only available in AltME Beta 1.1 releases (available on this website and to be released soon as AltME 2.0). In addition, to activate file sharing, you must restart your world server with the new 1.1. version of AltME. To view shared folders and files, click on the file sharing icon. You will find it with the other application icons in the upper left hand corner of the AltME screen. You will now see the file sharing window. The window will be blank if no files or folders have been added to your world. From the file sharing window you can view all folder directories, access all published files within AltME folder directories and see pertinent file/folder information. To open a file or folder, use a single click (just like a web browser). When you open a file, the default application associated with that file type in your operating system will be run. For example, when you open a spread sheet, Excel will open on a Windows system. When you click on a folder, the folder will open showing you its contents. If you can't stop double clicking, see the file options section below to have AltME use two clicks. Icon The type of file (Excel, Word, HTML, JPEG, etc). For published folders, a folder icon will appear. File/Comment The name of the file/folder and under the name is a brief comment about the file. Who Who last published the file/folder (top, colorized name) and who originally created or published the file/folder (lower name). Date The date when the file/folder was last updated (top, colorized date) as well as the date when the author initially published the folder/file. Size/Status The top line is the file size or the total of size of all files within the folder. The bottom line indicates whether the file is shared and if it is "in-sync" with the server. See the status possiblities below. You can sort your files and folders by name, publisher, date or size by simply clicking the respective words in the column headings. Gray The file is the same locally and on the server. Blue The file is not "in-sync" with the server. It is newer on the server and too large to be auto downloaded. Red The local file is newer because you changed it, you can publish the local version or reload the older version from the server. Yellow You have selected the option in the tool dialog box to display local files. The file is only local, not shared. To publish a file, go to the folder where you want to put it. Left click on the add file icon. This opens your computer's file selection window. Browse through your files and select the file you want to publish. Click the "Open" button. A dialog box will open giving you the option to put a brief comment about the file. AltME copies the selected file to its files directory. This directory is also accessible though the normal file system. When you modify a published file, its icon turns red to remind you that your copy is newer than the servers copy. You must publish the file again (right click on it and select publish) for other users to get the new file. 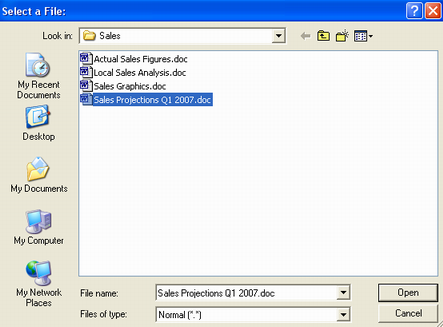 You can also create a new file by typing in the name of the new file in the select file box. AltME allows you to publish multiple files simultaneously. Select the files by using the cntl or shift keys and then click open. Files less than 100k will automatically be uploaded to all users you elect to share the file with. However, files larger than 100k are not auto-sync'd - you must choose to download that file from the server. This allows you to log on to AltME with out waiting for large files to be downloaded. Currently, AltME does not allow you to share files larger than 3 MB. During the downloading and uploading process, you will see upload and download progress bars. Creating folders helps you organize the files you share with others. When you create a folder, it is created as part of the normal file system and can be accessed like any other folder. To create a new folder, left click on the add folder icon. The AltME create folder dialog box will appear. In this box, you create a folder by typing its name and adding a comment if desired. Next you specify who should see this folder, the default is everyone (see private folders below). In this same box, you can select who can modify the files contained in this newly created folder. The last option tells the AltME world server to keep a copy of the file every time someone publishes the file. You can then recover the older version of the file if needed. It provides a simple method of file version backups. Note that enabling this option, your world server could potentially use a lot more disk space (for the older copies of the files). With AltME you have the option of creating private folders that are only seen by the user or group that you specify. A private folder is indicated by a special icon of a folder with a lock. 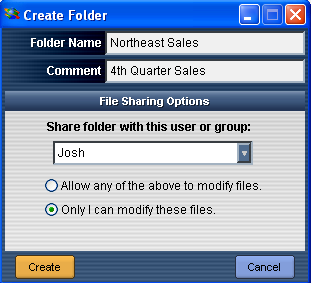 Here is an example of creating a private folder that is shared with only one user. Click on the create folder icon as above, type in the folder name and comment. Then locate the drop down share folder box, click on the arrow to view the list of users and groups that exist in the world. Select the user who you want to share this folder. You can only select one user from the list per folder. See the next section to share folders with multiple users. 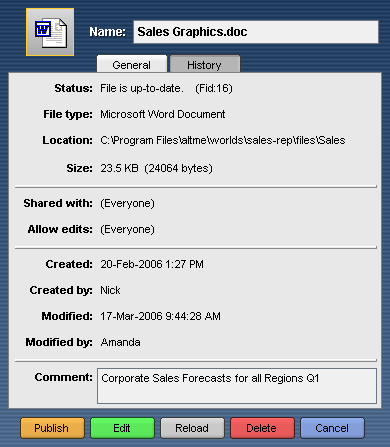 In this example, the user created the folder "Northeast Sales" viewable only by Josh and can be modified only by the publisher. The folder will be marked with the private folder icon. 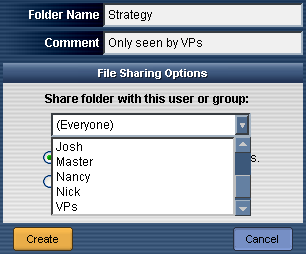 To share a folder with multiple users, they must be in a group created in the messaging area. Create a folder by clicking on the create folder icon as above, type in the folder name and comment. Then locate the drop down share folder box, click on the arrow to view the list of users and groups that exist in the world. Select the group that you want to share this folder. You can select only one item from the list. 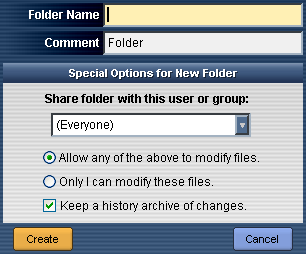 The modify option refers you to the users you have allowed to see the private folder. You can make a folder for your private use by selecting myself from the list, this is a handy way of making a backup of important files or ones you want to access on several computers. When you delete a user from a group that has access to a private folder, the files will exist on that users computer but the next time AltME syncs with that user, the private folder will dissappear from his file sharing window. Files published to the shared folder will no longer be downloaded to the deleted user, the user will only have the files published while they were a member of the group sharing the folder. To view detailed file/folder information as well as select multiple file actions, move your cursor over the designated file and right click your mouse. Status indicates current status of the file synchronization relative to the server. Size size of the file in bytes, kilobytes, or megabytes. Publish You can modify and upload the file's comments section without republishing the file. If you try to publish an older version of a file, AltME will ask for confirmation. If you attempt to upload a current file, AltME will ask if you want to upload the file or simply change the file's comment. If the file does not exist locally, AltME will tell you this, and ask if you want to change the comment. You can publish the file if it has not yet been published (i.e. if the file is local). Edit Opens the default editing application for the file based on its type. The editing application depends on you operating system settings. If there is no editing application for the file type, your operating system should prompt you for which application to open. Reload Use this option if you have modified the file locally but want to revert to the version of the file on the server. This option is ideal for a group who is collaborating on a document and a group member wants to revert back to the document on the server. Delete This removes the file from the folder on your system and those of all other users. However, the file will remain on the all users' local drive. If you want to delete local copies, you can enable this feature by selecting the "Allow local file deletions" option underthe file options icon described in a lter section. You can not force a delete on another user's local drive. Cancel Close the file information box and return to file sharing screen. Comment You can modify the file comment field and click on publish. A requestor box will give you option of uploading only the comment or uploading the file, too. The history tab is only shown if the file is being archived (see folder creation above). Clicking on the history tab shows you the different versions of the file available on the server. The top line in the history window is always the current version of the file. The previous versions are listed newest to oldest. In the example, Nick published the first version of the file on Feb 20, and Amanda published two more versions before Nick changed the comment and published the current version. To retreive an older version of the document, click on the file version you want. You will be prompted to confirm that you want to download the older file, and you will be given the option of saving the file under the existing name or a new name. Clicking on the browse directory icon in the upper right hand corner, lets you get to where your files are stored on your computer. When you publish a file, AltME makes a copy of that file in its files directory for your world. This feature opens your file system's window to the directory where AltME shared files are kept. You navigate the file directories on your computer to find the files you want to publish. You can also drag and drop files into the AltME directory from other locations on your computer. However, you have publish (right click on the file and select publish) these files through AltME in order to allow other users to view them. 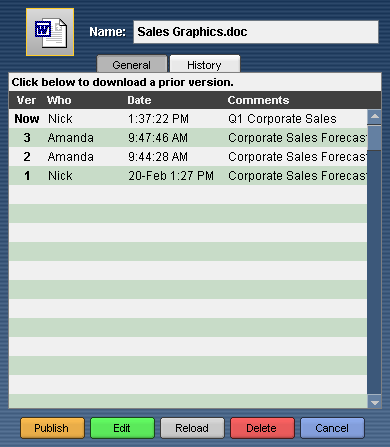 You can select multiple files to be published at the same time by using the cntl or shift keys. The files in this directory that have not been published are called local files. 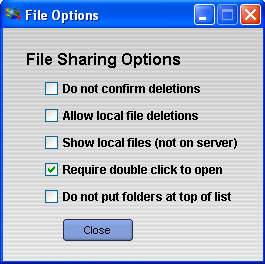 These files are displayed with a yellow icon in the file sharing window if you have selected the option to view them in the tools window (see next section). AltME will confirm with you before deleting a file. However, if you are a power user, you may not want such confirmation. This option allows you to disable it. AltME will delete the file from your disk when delete is requested. When selected, this means that if another user deletes a file, your local copy of the file (on your hard disk) will be deleted as well. The default is not to delete it locally, because the file could be more important to you than it is to another user. Normally, AltME shows only the files published in the AltME world, and any local files in the folder are not shown. When enabled, this feature allows you to see, and otherwise act on (delete, publish, edit), files that are only local on your system. These files appear in a special color (yellow) to indicate that they are not shared files, but local to your system only. AltME requires only a single mouse click to open a file, similar to how all web browsers work. However, if your are accustomed to double clicking on files, this option will allow that to happen. AltME displays folders at the top of the window and the files below them. However, many non-Microsoft systems list the folders with the rest of the files (in whatever order they appear, such as in alphabetic order). If you enable this option, the folders will be listed with the files, not at the top. AltME�s addition of file sharing comes as a request from our user base. This feature is a legitimate need that greatly enhances communication and collaboration in private worlds. However, keep in mind that exchanging copyrighted material that you do not own is strictly illegal and a direct violation of the AltME user agreement. Any such activity will immediately terminate your AltME license agreement. In addition, the user bears the full responsibility and legal ramifications for any such copyright infringement.